We offer good old-fashioned service and quality products. Whether your plumbing needs are residential or commercial, we service them all! We stand behind our work and guarantee our customers’ satisfaction. A1 Service Plumbing, Inc. offers a wide range of plumbing services and repairs. Contact us today to arrange for service or an estimate – save even more with our coupons. We are authorized service providers for Rheem, Ruud, State, A.O. Smith, Bradford-White, and G.E. You know you can trust us with quality and reliable installation and repair at reasonable rates. In fact, you can save even more with $15.00 off when you use our water heater installation coupon! A1 Service Plumbing, Inc. has been serving Central Florida residential and commercial clients for 54 years. When you partner with A1, your total satisfaction is our top priority! We offer good old-fashioned service and quality products. Leaks, clogs, blocks, and bursts, whether the job is large or small, we will service them all! We stand behind our work and guarantee our customers’ satisfaction with over 54 years of experience in the Orlando area. Give us a call — we’ll be there in 24 hours or less. A1 Service Plumbing offers a wide array of services for commercial properties. From inspections and installations to maintenance and repairs, whatever the needs of your business happen, our experienced technicians aim to deliver the same-day response and high-quality service you need for least possible disruption to your operations. 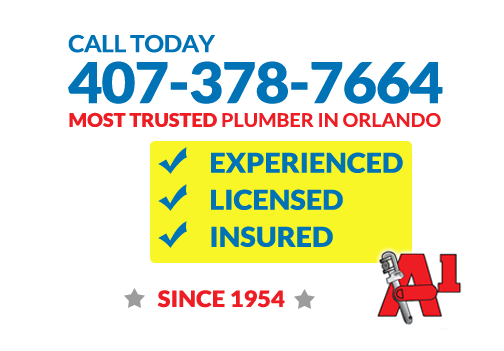 Since 1954, A1 Service Plumbing has brought skilled workmanship and professionalism to Orlando plumbing, serving local families and businesses with qualified care around the clock. We are licensed and insured, with decades of experience and a guarantee of satisfaction to back our prompt and dependable service. Our goal as the area’s most trusted Orlando plumber is to deliver immediately with high-quality responses to calls both commercial and residential. Our emergency Orlando plumbing services are available 24 hours a day and 7 days a week. We understand the frustration of having to cope through the weekend with faulty piping or a broken water heater, the inconvenience of a restroom in disrepair or flooded water that damages walls and floors. We respond promptly to every service call within the same day to quickly resolve the issue before it becomes a costly complication. When pipes freeze, burst, or become warped with age our technicians are standing by as the community’s most reliable plumber in Orlando. Repiping may seem like a daunting project, but in many cases replacing outdated pipes with reliable and more durable material can save you the mounting costs of constant maintenance and repairs. Flow guard flex piping is backed by a 30-year manufacturer’s guarantee and our own personal 10-year guarantee for labor. Do not settle with the constant stress of unstable pipes, cracked and backed up with years of built up sediment. Take advantage of our online discounts and schedule an estimate for repiping today. We provide the sale and installation of all the leading brands of available water heaters, and we are qualified to fix any make or model. If your water suddenly becomes discolored or foul smelling, your energy bills seem to be steadily rising, and your showers are unpleasantly cold, call A1 Service Plumbing for an immediate fix. Newer models are now more affordable and more efficient than ever before, so have a trusted emergency Orlando plumber ensure a quality installation. If it leaks, clogs, blocks, or bursts, the trained experts at A1 Service Plumbing are prepared to deliver quality service. Whether for your home or business, we perform inspections, installations, repair, and maintenance on several top quality brands. No job is too big to take on or too small to merit dedicated attention. Call today for emergency service or a free estimate. If you are looking for a trusted Orlando plumbing service, contact us now for friendly and fast services. With A1 Service Plumbing Our customer is our first priority. Our company offers a number of plumbing services including Orlando re-piping, Orlando emergency plumbing, Orlando renovation support and more. Our company offers an old-fashioned level of service as well as high-quality products for installation and replacement. Please contact A1 Service Plumbing if you require an estimate on any type of Orlando plumbing service. We deliver 24 hours service in Orlando for water heaters and we can provide assistance with water heater brands such as Ruud, State, A.O. Smith, Bradford-White, GE and more. Get plumbing service in Orlando that you can trust with reliable repair and installation services at rates that are extremely reasonable. By using our installation coupons you can save on the cost of any type of hot water heater install. Our company has been working in central Florida with a number of commercial clients over five decades. When working with our Orlando plumbers, you can have confidence knowing that you will be getting the best in plumbing support and repairs. We want to deliver the best quality products in Orlando. We can make recommendations as to the best replacement products and some of the finest fixtures on the market. We want to make sure that you’ll be well covered against regular plumbing issues like clogs, blockages, burst pipes, and more. Contact us at any time in the greater Orlando area and we can be there in 24 hours or less for you. As part of our commercial services we can offer a wide range of plumbing solutions even for large properties. From installation support to maintenance and repairs, our company can provide you with quick responses for the best quality of service available. We want to make sure that there are no disruptions within your business and that your operations can resume even if you’ve had a problem with your plumbing. Our company has been in business as Orlando plumbers for over five decades since the year 1954. We want to make sure that we can bring the best in professionalism and workmanship to every single Orlando plumbing appointment that we make. We offer 24 hour service throughout Orlando we are a licensed and insured plumbing support group. Our company has decades of experience as well as a guaranteed satisfaction on all of our services. As one of the most trusted Orlando plumbers in the area, we want to deliver the best in residential and commercial solutions throughout the greater Orlando area. We are available 24 hours a day and seven days a week to provide solutions in fixing up faulty piping, replacing broken water heaters and more. We want to make sure that we can respond to every type of service call promptly. As one of the longest running plumbers in the greater Orlando area, we want to ensure that we can always deliver high-quality responses for commercial and our residential clients. We can deliver sound advice on the replacement of fixtures, emergency repair services and more. We understand that any type of emergency with your plumbing can be a difficult situation to deal with. This is why we make ourselves available on weekends and throughout any time to fix up any type of broken water heater or faulty piping. Our company can respond quite promptly to any type of service call and make sure to resolve the issue early before the need for a costly repair or extensive plumbing issue arises. For top-quality re-piping services in Orlando, our technicians want to provide some of the most reliable services in our community. If there’s ever a case where pipes have burst, frozen or become warped our technicians can help through the re-piping process. By working to replace any of the outdated pipes within your home and being on hand to help with an emergency, we can help to ensure that re-piping solutions can be done in a much more reliable manner. Through the durable materials that we can deliver, we can make sure to save you money on constant maintenance, mounting costs and more. The piping solutions that we deliver can be backed up by more than a 30 year manufacturers guarantee as well as a 10 year guarantee on all of our labor. We want to make sure that you can get access to the best repiping services in Orlando. Contact us today to replace any pipes that have filled up with sediment or experienced issues within your home or office. We also offer ongoing discounts and promotions for our re-piping services in Orlando. 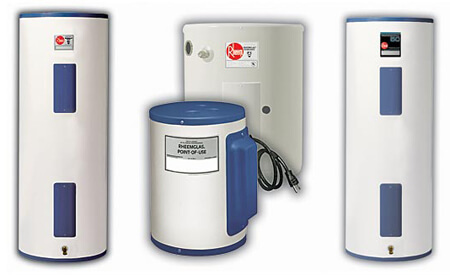 Our company can provide sale and installation support for a number of different water heaters. Our company is qualified to provide repairs or replacement on any commercial or residential water heater on the market today. If you have noticed any type of discoloration in your water or that the water coming out of your tabs has become foul smelling, contact us immediately and we can perform an inspection. Other signs for concern could be an energy bill that consistently rising or a shower that takes a very long time to heat up. We can provide immediate fixes and 24-hour support for any make and model water heater. The newest models of water heaters can be more efficient than ever before and by using our qualified emergency Orlando plumbers we can work at helping you save money on every energy bill. Our quality installation is backed by a warranty and we can help to improve your property efficiency in Orlando today. Contact our emergency plumbers in Orlando if you require access to immediate plumbing services from an experienced provider. We offer free estimates and a number of different promotions throughout the year. Our plumbing technicians are ready to take on any challenge you may have in Orlando!